These were the types of things Retrac was going to be saying. I liked it better without. Gave him Tom Haverford face. I also like the empty white space. Where are they? The Land Of Offensive Graphs. It's like that space in The Matrix where there's nothing until there needs to be. Like, at first, there's a void. Then BAM! 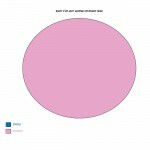 NECESSARY PIE CHARTS!